Next time you query a set of local business related keywords in a search engine, notice that many of the top results comprise of a mixture of Google plus pages and business directories pages. 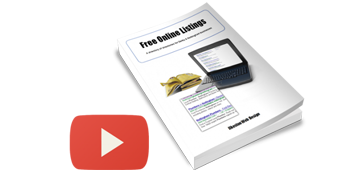 These top results are pages usually featuring business information relevant to whatever you typed into the search engine and by signing up to good quality free directories you too can piggyback these search results. Think of ANY web page as virtual real estate or digital property. There is even an address. The cash value of this virtual property is determined by how many potential customers land on these pages, see the business information and eventually go on to make a purchase. A kitchen fitter selling fitted interior designs could register their information on a free online business directory, effectively squatting on someone else’s property. If this kitchen specialist charges a maximum of £20, 000 for his services, and he sells two kitchens at full price as a result of publishing their business information on (for example) a Thomson local page, then that page is worth £40, 000. Think of your business directory listings as funnels. A funnel is a cone shape, with the wider end capturing qualified leads and guiding them closer to taking an action such as picking up the phone or visiting your website link. A simpler way to illustrate the concept is to think of people going in one end of the funnel and money coming out of the other. Do not make the mistake setting up funnels with a mass production factory mentality. Each free business directory you register for needs to be set up with care and attention. The best directories allow pictures, videos, maps, links, social media feeds and more to be added. The more detailed and comprehensive your listings are, the more likely they are to convert. You only need to set up the free listings once and they are usually good forever. I have seen listings I set up years ago for another business still live. To summarise, you only need to do it once, but you need to do it well. The PDF below is a business directory report for annually subscribing clients. Become a client of Ilkeston Web Design and the information is yours. There is 70+ hours of research and analysis so make the most of this and use it to your advantage. To become a client please first look at the Client Area page and make your way through each step of the process. To make an enquiry please see the contact page. If you’d like a one on one live video consultation session, this can be arranged ahead of time. Do you require a new website or modifications to your existing one? Are you considering a redesign?